Lettuce cups: the first time I’d heard of them, I was incredibly unenthused. It sounded like a sad attempt at making an exciting low-carb snack. But, since I’m a believer in the “Don’t knock it ’til you try it” rule, I tried them anyway and I was soon eating my own words because they. were. incredible. But you don’t have to be experimenting with the low-carb lifestyle in order to enjoy these crave-worthy Hoisin Shrimp and Cashew Lettuce Cups. They’re crisp, refreshing, and brimming with big juicy shrimp and toasted cashews tossed in a lip-smacking sauce made up of hoisin, honey, and ginger. Needless to say, these bad boys are a total crowd-pleaser. So if you’re still scratching your head over what kind of nosh to offer up at your Labor Day cookout, look no further. What makes an irresistible lettuce cup is the filling, and what makes the filling is the divine sauce you stir into the mix. Lee Kum Kee’s Hoisin Sauce does magical things. Created with an assortment of spices, soybeans, and sweet potatoes (gasp! ), this good stuff will satisfy anyone who covets sweet and savory blends. Not only does it make for great sauces, but it also shakes things up as a marinade, too. You’ll probably want to grab a few bottles of this good stuff the next time you hit up the grocery store, because it’s super versatile and your options are ENDLESS. Lee Kum Kee was established in China in 1888 and, since the very beginning, has been committed to supporting Chinese culinary culture throughout the U.S. and beyond. They have a selection of over 200 authentic sauces and condiments made up of premium-quality, non-GMO ingredients and, for those with special dietary concerns or restrictions, Lee Kum Kee proudly offers several gluten-free sauce options. With that said, everyone gets to enjoy restaurant-quality East Asian tastes in the comfort of their very own home with minimal effort, thanks to Lee Kum Kee. So, impress your friends and fam by bringing some East Asian flare to your table this Labor Day with these mouthwatering bites! They’ll thank you. Not sure if Lee Kum Kee is available near you? Find out here, or shop their online store! 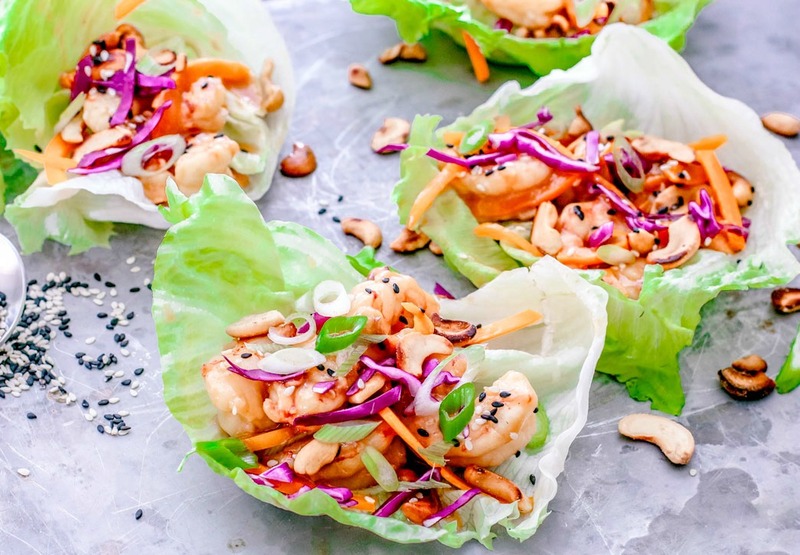 These Hoisin Shrimp and Cashew Lettuce Cups are full of crisp, crunchy textures and sweet n' salty flavors. Perfect for a light dinner or entertaining! Cut head of lettuce in half and start to peel away layers that will work well as cups. Wash them, pat them dry, and set them aside. Heat cooking oil in a large pan over moderate heat. Add the shrimp, and cook for 2-4 minutes or until opaque, flipping them once throughout. Cooking time depends on the size of the shrimp, but shrimp cooks easily, so care not to overcook. Once shrimp is cooked through, remove from heat and set aside. Heat a medium saucepan over moderate heat. In a bowl, whisk together all the sauce ingredients until cohesive. Add them to the saucepan and bring to a simmer. In a cup or small bowl, mix together the corn starch and cold water until well blended. While stirring the sauce, slowly add half of the corn starch mixture to the simmering sauce to thicken it. Stir well. If the sauce still seems like it could use some thickening, add the remainder of the mixture, stirring until well blended. Once the sauce has reached the thickness you desire, remove from heat. Add the shrimp and julienned bell pepper to the sauce. Stir to coat. Spoon servings of saucy shrimp into lettuce cups, then top with red cabbage, scallions, toasted cashews, and sesame seeds. Prep time will change drastically if you buy shrimp that needs to be peeled and deveined. If you're making a large batch, I recommend buying shrimp that has already been peeled and deveined, and is ready to cook. I had the same unenthused-to-fan-girl transformative experience with lettuce cups. They are the MOST. This is a to-die-for combination of flavors and textures—and gorgeous too! Oh my goodness, this sounds delicious! I mean, I love cashew chicken - cashew shrimp would be even better, especially with this delicious sauce. I'm with you, I was initially quite skeptical of lettuce cups, but have definitely come around. This would make an amazing BBQ starter or side! These look a fab party food or appetiser. I love the combination of flavours and Lee Kum Kee is a fab Chinese sauce.